Poitiers is a city in France, the prefecture of the Vienne department in the Nouvelle-Aquitaine region. The town is picturesque; and its streets are interesting for their remains of ancient architecture, especially of the Romanesque period, and the memories of great historical events. 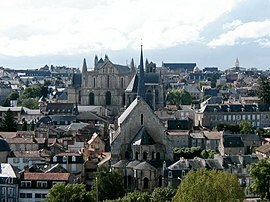 Poitiers is in the centre of the Vienne department, between the valleys of the Boivre and the Clain rivers. The old town is on the slopes and the summit of a plateau which rises 130 feet (40 m) above the streams which surround it on three sides. Poitiers is at about 220 km (140 mi) from Bordeaux, 340 km (210 mi) from Paris, 130 km (81 mi) from Limoges and 180 km (110 mi) from Nantes. The commune has an area of 42.1 km2 (16.3 sq mi). Its average altitude is 105 m (344 ft); at the city hall, the altitude is 116 m (381 ft). The climate of Poitiers, in the Köppen climate classification, is Cfb - Oceanic climate with template summers. The inhabitants of Poitiers are known, in French, as Pictaviens (women: Pictaviennes). With a population of 87,435, Poitiers has a population density of 2,076 inhabitants/km2. Poitiers forms, with seven other communes, the urban area of Poitiers with a population of 128,111 inhabitants (2013) and an area of 172.3 km2 (66.5 sq mi). This urban area is the centre of the metropolitan area of Poitiers, formed by 97 communes, with a population of 257,233 inhabitants (2013) and an area of 2,303.4 km2 (889.3 sq mi). Poitiers-1, with 23,086 inhabitants (2014). Poitiers-2, with 25,371 inhabitants (2014). Poitiers-3, with 26,843 inhabitants (2014). Poitiers-4, with 20,756 inhabitants (2014). Poitiers-5, with 22,170 inhabitants (2014). It is part of the intercommunality Grand Poitiers (French: Communauté d'agglomération Grand Poitiers). Cathedral of St. Peter, west side. Saint Pierre de Poitiers cathedral. ↑ "Le Maire et ses adjoints" (in French). Ville de Poitiers. Retrieved 18 April 2017. ↑ "Commune de Poitiers (86194)". Comparateur de territoire (in French). Institut national de la statistique et des études économiques - INSEE. Retrieved 18 April 2017. ↑ "Poitiers". Map-France.com. Retrieved 18 April 2017. ↑ "Ville de Poitiers". Annuaire-Mairie.fr (in French). Retrieved 18 April 2017. ↑ "Vienne (86)" (in French). habitants.fr. Retrieved 18 April 2017. ↑ "Régions, départements, arrondissements, cantons et communes" (PDF). Populations légales 2014 (in French). Institut national de la statistique et des études économiques - INSEE. Retrieved 18 April 2017. ↑ "Unité urbaine de Poitiers (86601)". Comparateur de territoire (in French). Institut national de la statistique et des études économiques - INSEE. Retrieved 18 April 2017. ↑ "Aire urbaine de Poitiers (039)". Comparateur de territoire (in French). Institut national de la statistique et des études économiques - INSEE. Retrieved 18 April 2017. ↑ "Poitiers et ses villes jumelles" (in French). Ville de Poitiers. Retrieved 18 April 2017. Wikimedia Commons has media related to Poitiers.